CA Syllabus PDF Files Free Download: ICAI has released the notification about “CA New Syllabus” Students who have joined in Colleges recently in CA Course are very eager to know the CA New Syllabus 2018. So in this article I am going to provide you the New Syllabus of CA. Through this post you will get the Syllabus of CA Foundation, CA Inter, CA Final Courses. Here is the CA Foundation Syllabus which consists of 4 papers. PDF File links are provided below to this table. Download the PDF Files of CA Foundation Syllabus by the link provided to you. CA IPCC Inter Syllabus contains two groups divided into 8 papers. Download the PDF Files of CA Intermediate Syllabus by the link provided to you. CA IPCC Final Syllabus contains two groups divided into 8 papers. 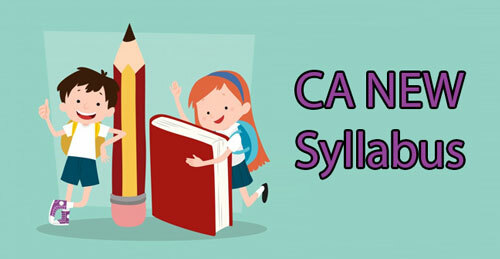 Hope this article will be useful to the CA students to know the CA Syllabus and to download the PDF files of CA Foundation Syllabus,CA Intermediate Syllabus and CA Final Syllabus. Don’t Forget to Download the Syllabus PDF Files .